The first mention of a fortress on the site of today’s Schkopau was in the 10th century. From this period only the keep and the outer defensive wall survived the ravages of history. In the 15th-century the estate passed into the hands of the noble Trotha family, who rebuilt the castle in a grand Renaissance style. Now a place of refinement, comfort, and the center of the region’s social life, crowned heads and noble families visited here throughout the centuries. The Trotha family retained the property until 1945, when it was confiscated and used as a refugee shelter. Eventually, the castle was vacated, falling into ruins. In 1996, restoration began, and by 2001 the doors were open as an exclusive castle hotel. I realize fees for parking are a hotel revenue stream, but still, it’s disappointing—if not irritating—to pay three euros for parking at a hotel in a German village. 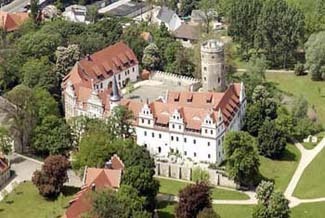 Schkopau is 25 km west of Leipzig. From Halle, Schkopau is 10 km due south on route 91. The nearest main train station is in Halle. Schloss Schkopau is a nicely restored Renaissance castle hotel, well located (if you have a car), and in easy driving distance of Halle and Leipzig. Surrounded on three sides by parkland, trails that pass by the hotel are ideal for early morning walks or jogs. Despite the modern furnishings, the hotel still retains touches of its original character. Guest rooms are clean, large, and comfortable, with views of the park or castle courtyard. Some rooms have immense bathrooms. The hotel restaurant serves excellent candlelight dinners beneath a white barrel-vaulted ceiling. On the menu is a wide selection of entrées, featuring regional and international cuisine, as well as local wines. Dinners for groups are available in private rooms. In the bar, after dinner drinks may be enjoyed in front of a warm fireplace. During good weather, the hotel opens up the outside terrace.